Presidential candidates are more than the sum of their position papers; they are a product of their life experiences. The Globe's seven-part series, the most comprehensive biography of Mitt Romney, examines the forces that have shaped this Republican candidate for president in Campaign 2008. A car crash when Mitt Romney was driving claimed one life and changed his. The privileged son of a larger-than-life man turned serious and self-directed. In France, Romney tried to win converts to his Mormon faith. His family's past was intertwined with that of the church, from its earliest pioneer days. 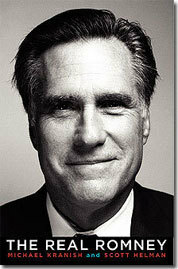 Romney led Bain Capital from $37 million to $4 billion in assets. Only his colleagues knew how much he sweat behind the scenes. Even family time was regimented, a lesson Romney's sons - and dog Seamus - learned. Meanwhile, in Romney's first campaign, Ted Kennedy did the teaching. Leading the Salt Lake Olympics forged his ''turnaround'' reputation. But colleagues say buffing up his image for a political career was never far from the surface. Romney steered the state through a major fiscal crisis. But critics say he overstates the feat and understates the side effects, including big fee hikes. He helped bring first-in-the-nation universal healthcare to Massachusetts. But as his focus shifted to the presidency, so did many of his positions. This book is the first complete, independent biography of Mitt Romney, a man whose journey to national political fame is at once remarkable and thoroughly unsurprising.